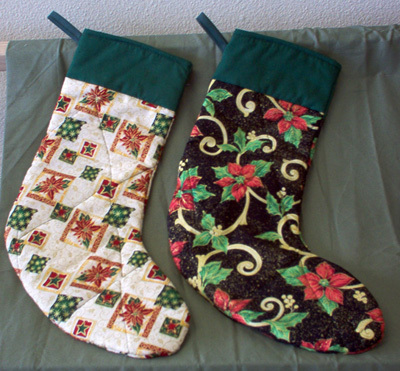 I can/ will make similar projects for you on a custom basis. 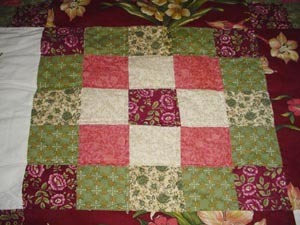 You provide the ties, shirts, other clothing items and I will design and piece a memory quilt for you. 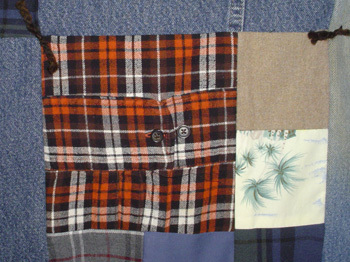 I can make quilts using men's clothing as shown below. 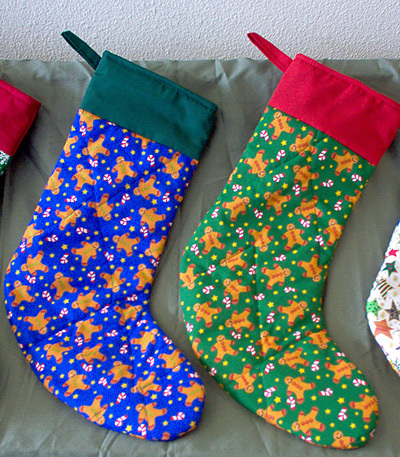 I can do something similar using women's or children's clothing items. Each quilt will be unique to your loved one. 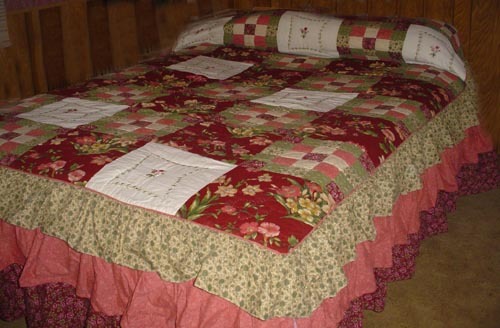 Depending on the amount of fabric you provide, the complexity of the design, and whether you want hand quilting or machine quilting the price will range from as little as $5 per square foot (top piecing only) to as much as $22 per square foot (finished quilt with hand quilting). When my father passed unexpectedly we were all devestated. Two of my sisters didn't even get to see him before he was gone. 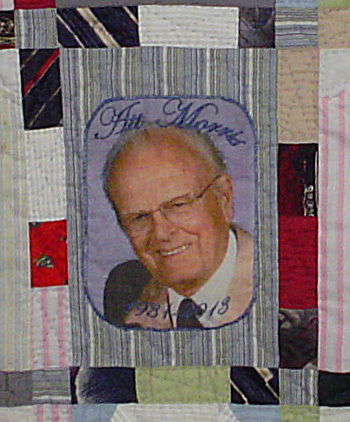 I had made a few quilts by then, and thought a little lap quilt made from his clothing might be a sweet reminder of him. By the time I thought of this, mom had already disposed of his belongings, but in the back of the closet we found 5 ties. 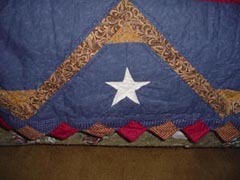 These became the center focus of the quilt. I used the standard "Bow Tie" quilt pattern, and by using other fabrics I was able to get 4 complete quilts from the 5 ties. The finished size is 48" x 48"
Fast forward a dozen years. My mom had remarried, and her second husband fell ill and died. 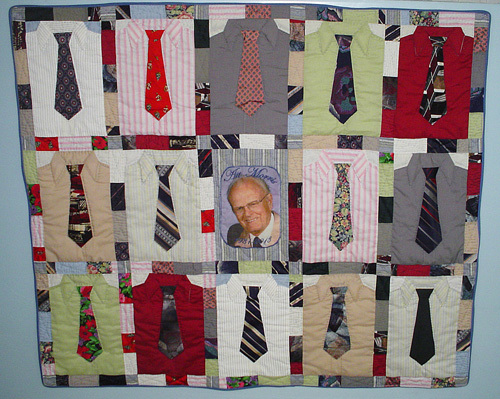 Thinking of the quilt I had made from my father's ties, I thought I could do something similar. 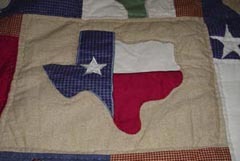 But I wanted it to be different from the first quilt. I created a "Shirt and Tie" pattern and managed to get several dress shirts and 14 of my step-father's ties from mom before she disposed of his clothing. This time I was able to add a photo printed on fabric (Isn't technology great?) as the center block. The finished quilt is 48" by 60" Again, by using the shirts and ties with other fabrics I was able to stretch the fabrics enough to make 4 complete quilts, one for mom and one for each of his other children. 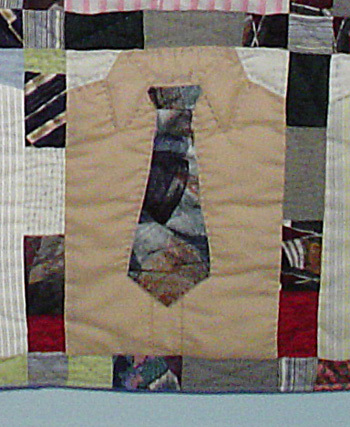 A customer requested a quilt, but her husband was not the shirt & tie kind of guy. He was more casual and she only have work shirts and jeans. So we kept it simple, basing the design on a simple 9-patch and using his shirts to make the patches. 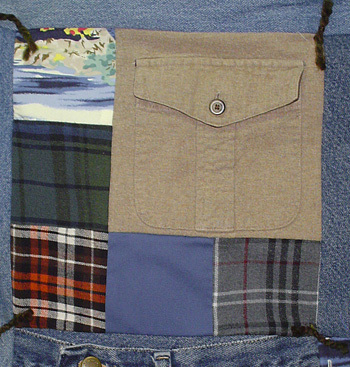 I interspersed larger sections for variety, and alternated the patch blocks with sections of his jeans. 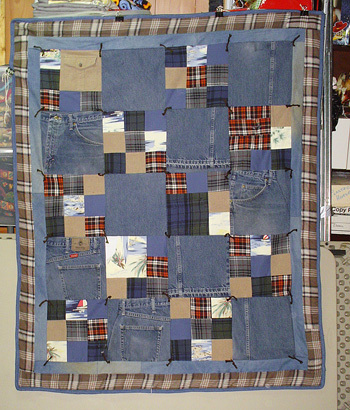 Again, by using the shirts and jeans with other for the boarders fabrics I was able to stretch the fabrics enough to make 4 complete quilts, one for the mom and one for each of his other children. 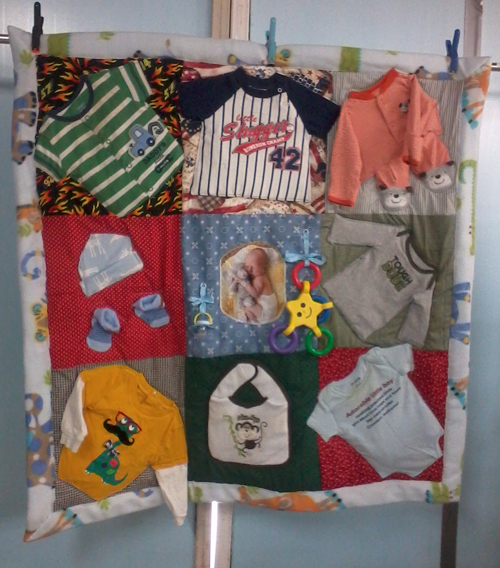 This is an example of a baby quilt that could be made using the baby's picture and some of its first clothes. The back is a receiving blanket. 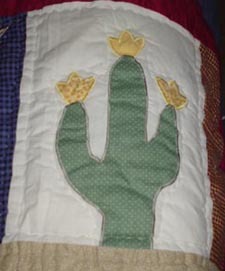 Actual blankets would have the child's name and birthdate embroidered on the picture block similar to the picture block on the "Dandy Dad" quilt. 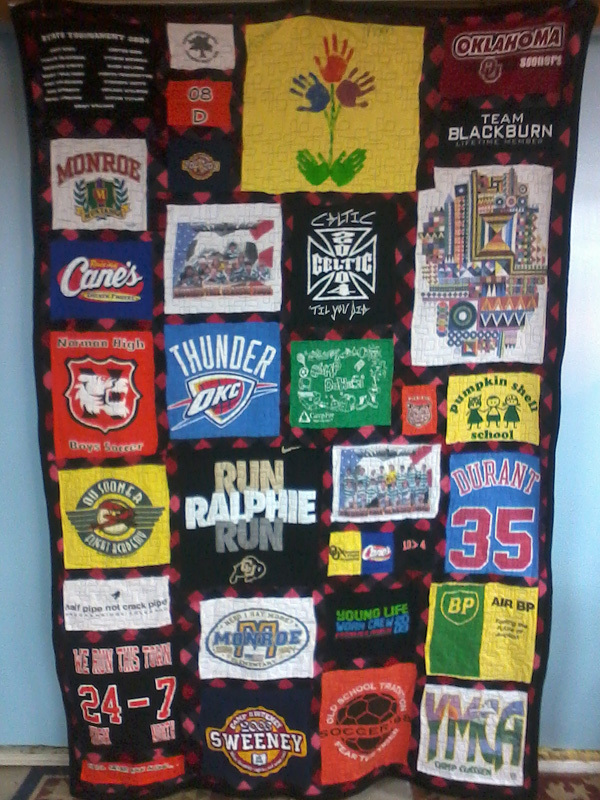 The finished size of this quilt is 40" x 40"
This is t-shirt quilt that was made using t-shirts saved from Kidergarden though college. 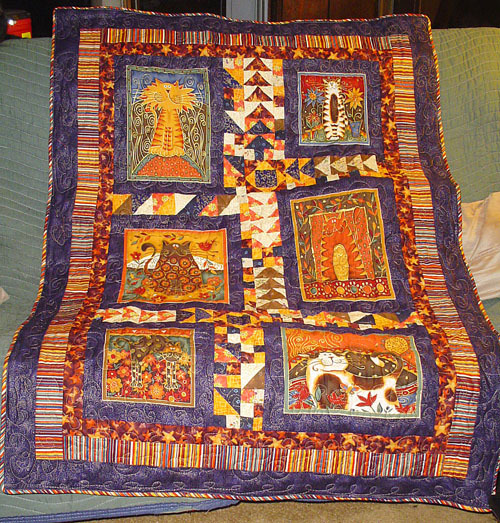 The back and block borders are fleece. Finished size was 60" x 80".40"
A customer had saved some cat print fabric she liked, but had never done anything with it. She gave it to me and this was the result. The finished size is 36" x 48" This piece was machine quilted using a random swirly pattern. Completed price was $144. 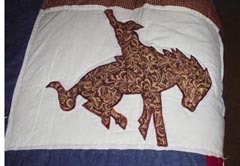 This quilt can be used on a queen or king size bed. 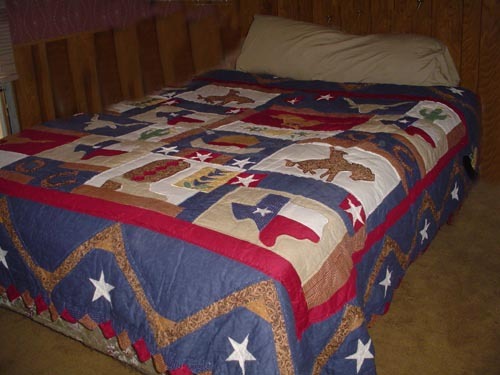 It is shown on a queen bed. The overall dimensions are 100" wide by 96" long. 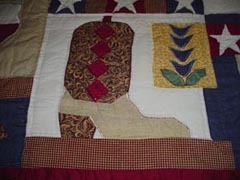 The quilt consists of machine appliqued blocks which have been machine pieced. 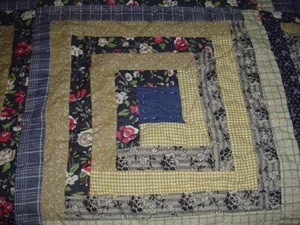 The quilt is finished with hand quilting. 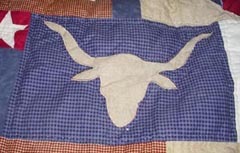 This quilt is not new - about 20 years old, but it has never been used. Asking price was $250 plus shipping. 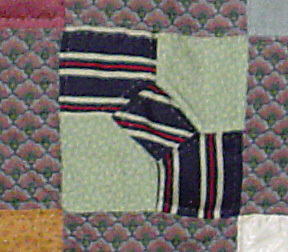 These are the major blocks in the quilt. These are the minor connecting blocks and the border details. 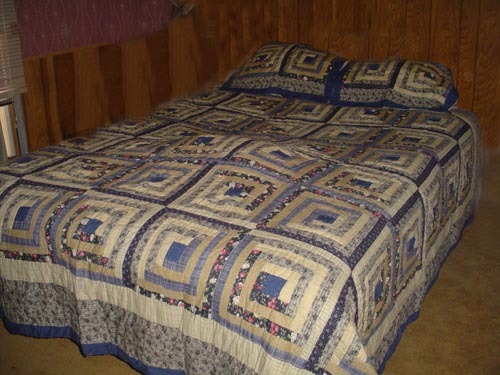 This quilt can be used on a queen or king size bed. It is shown on a queen bed. The overall dimensions are 104" wide by 100" long. 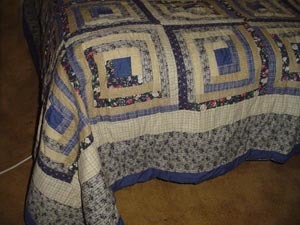 The quilt consists of machine pieced blocks in the "Log Cabin" pattern. 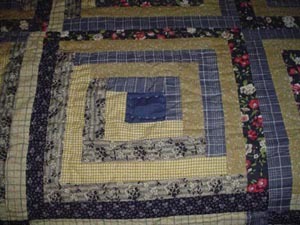 The quilt is finished with hand quilting. 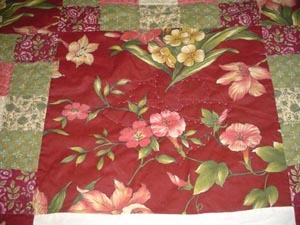 Included with the quilt are two standard sized pillow shams. 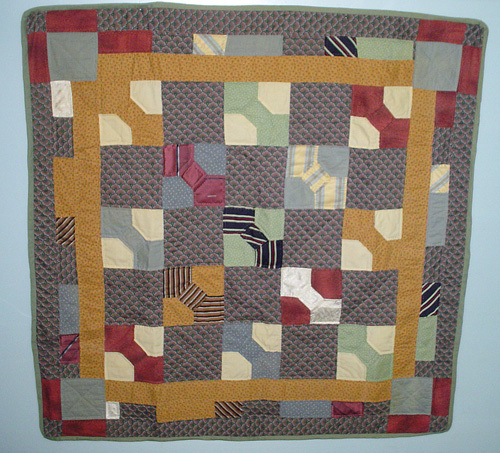 This quilt is about 15 years old. It has been gently used. There are no rips or tears, but there are a few areas that are faded. These are the major blocks and the border details. 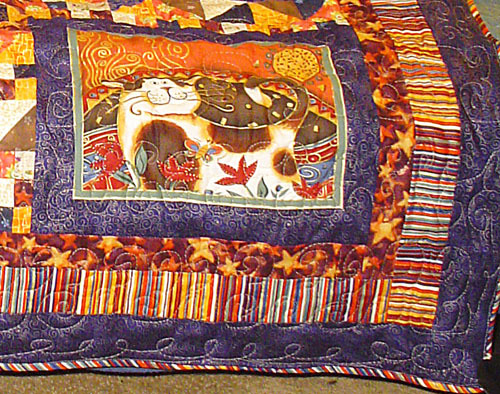 This quilt is designed for a king size bed. 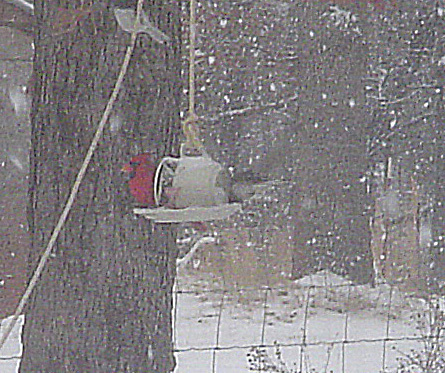 It is shown on a queen bed, with the excess hanging off the far side. 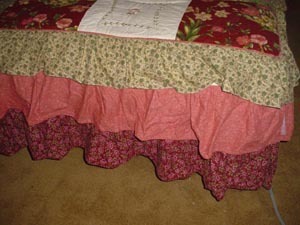 It has a three tier skirt which is 22" long. 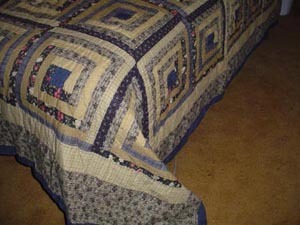 The bed top portion of the quilt is 72" wide and 96" long, which is long enough for a pillow tuck. The overall dimensions are 116" wide by 118" long. 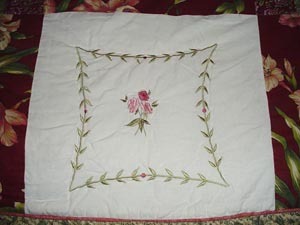 The quilt consists of machine pieced blocks, including some with machine embroidery. 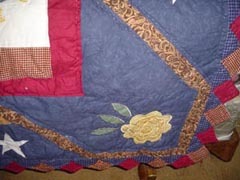 This is a vintage quilt, about 25 years old. It has been used. 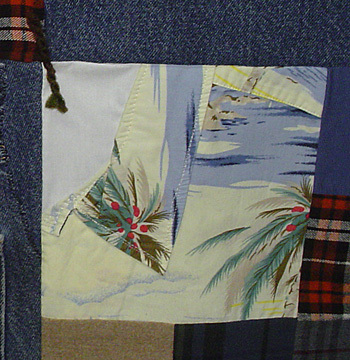 There are no rips or tears, but there are several small stains and faded areas. Asking price was $200 plus shipping. These are the major blocks and the skirt details. 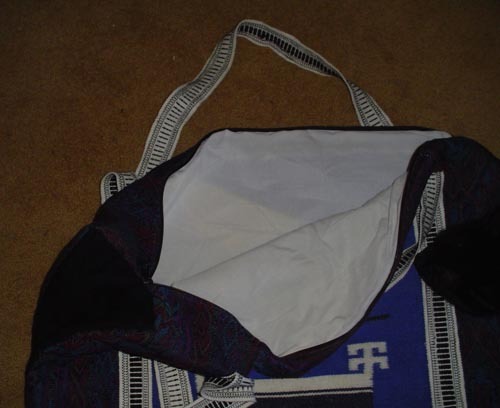 This tote is constucted of sections of a blanket or rug type of weaving of Thunderbirds bordered by a brocade type fabric. 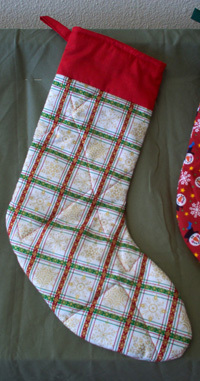 It is lined with linen or cotton fabric. It has a zipper closure. Overall dimensions are 25" wide x 12 " tall x 7" deep. 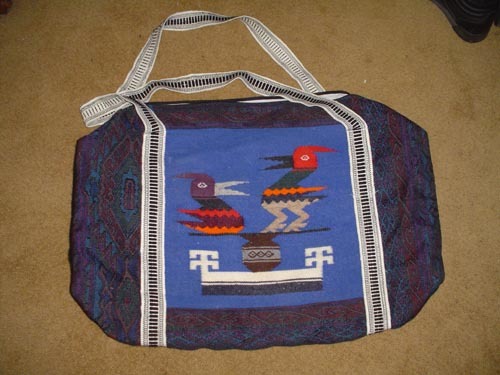 The Thunderbird pattern is repeated on both sides. 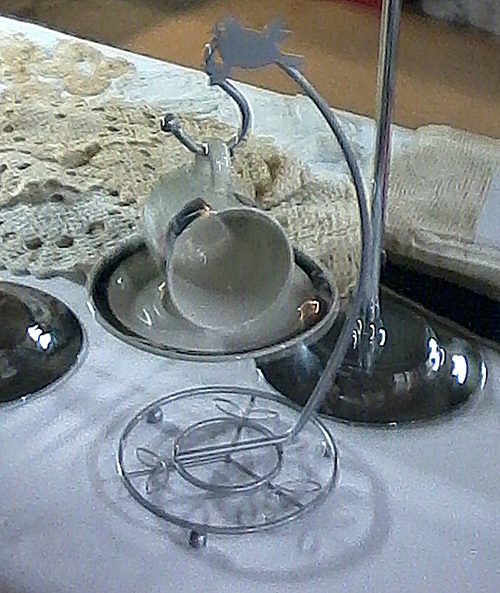 Bird feeders made from cups and saucers. They work amazingly well. I have a variety in stock. Asking price is $10 ea or 2 for $15 plus shipping. 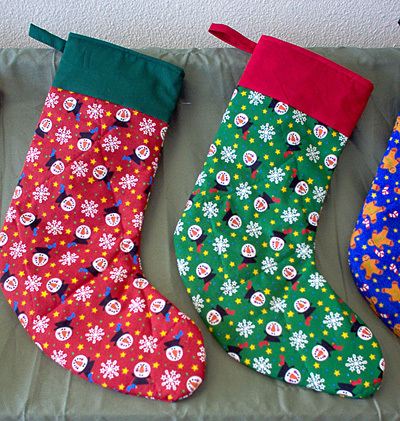 I have a variety of stockings for sale. 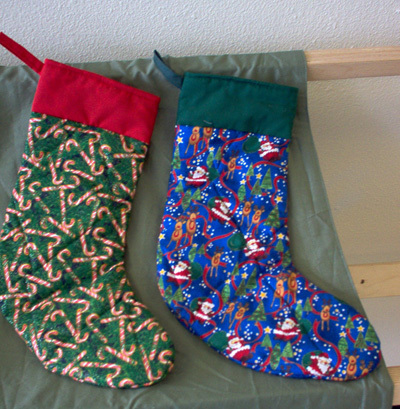 They are approximately 8" wide at the top and a total of 24" long. 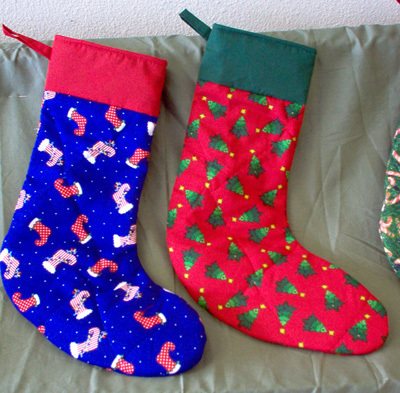 Plain stockings run $8 each plus shipping. I can personalize them using gold or silver glitter ink for a total of $10 each plus shipping.